Do you work for ownCloud? Learning about ownCloud? We can help. The main advantage of Owncloud is the fact that it is a free, open-source solution that allows us to create a cloud and manage its content using applications available on most major operating systems, and mobile. Owncloud allows us to synchronize your data, so we can use Owncloud to create backups. Another great advantage of Owncloud is the fact that any limits of disk space do not limit us because it depends on the disk we have on the server, so we can significantly save on the purchase of a dedicated cloud solution. Owncloud is used when sending small and large files, so you can save a lot of time on sending attachments because each file stored on Owncloud can be shared with an external link. One of the drawbacks that can be annoying for some users is that we are responsible for the cloud created using Owncloud and we do not have the support that would be able to help us. If you are looking for a solution that will allow you to create your cloud, you should consider trying out Owncloud, especially since this solution is available for free and has documentation that will make it much easier for us to install. By using Owncloud, I save a lot of money on the purchase of a cloud from a provider. "All your files in a private cloud, easy to use"
It is very simple to install and much easier to use, you can have tur organized files in folders and share them with whoever you want. You can indicate who can and who can not see the files. Its interface is very simple and intuitive, nothing to envy to other commercial solutions that offer the same service. It has an app for mobile devices, which makes the user has very easy access to your cloud. The implementation of this software is very simple and can be done in any equipment that complies with the basic characteristics to be installed. Since he has more than fulfilled his wide market helps its implementation in large quantities. Being a free software you have the freedom to do what you want with this software. The possibilities are endless. Its interface is very simple to use, it does not require to be an advanced user in infomatica. It has application for mobile device, which facilitates its access. It is a platform for easy installation and very easy to manage, both for the administrator and for the end user. Being free software, it can be customized according to your preferences. Sharing files with several users both inside and outside the company, with its versatility just to authorize users or send the link to the file or folder already authorizes the use of files. The hierarchical structure of the users allows to establish different permissions to be able to enter and manage their files. Now the files are in a private cloud which can be accessed from anywhere in the world that has an Internet connection. "Very good alternative to comercial clouds"
OwnCloud allows you to create your own cloud system to store files, manage calendars, contacts or event tasks. The best is that is opensource, and is maintained by the community. As a difference with the commercial systems, the files that you save, will be stored in your server, while the limit of space is the amount that you want, equals with the number or users. In other words, you don't need to take care about the space that you use or the number of users that pay license. As a negative point, just I can say that is not a closed system like Dropbox or Google Drive that you can start using without any previous consideration, in owncloud, you need an IT specialist that set the service up. It allows our organization to store the files online, been accessible from anywhere. Also the collaborative environment allows as to share files or calendars between as with any difficulty. "the best application to store my files." It has excellent functions which helps me keep my work in order, with my colleagues, I can synchronize all the files on different computers, it's super safe since I can encrypt the files, has online music reader, online text editor, viewer of online documents (PDF, OpenDocument), among many other functions. In the company did not work very well ownClound, at the time of passing all the information from the PC to the cloud, several files were deleted, which more we can never see. At this time is in maintenance in the company, but this private cloud is very good because it gives stability and security, the features and functions offered to users is of higher quality and is a cheaper service, which helps you reduce expenses to the company. For the company, one of the benefits was to be able to share the files among the employees, without the need to use flash drives or emails to share the information, however in the company they have not had a good use, perhaps due to lack of knowledge of the program. "the right solution for tech savvy businesses to control their own file sharing, free if small scale"
owncloud installation and the built-in updater make operation easy. the community edition gives more than a stripped down basic functionality, and can support daily use - so long as the user base is manageable. for instance features such as denying filetypes, ransomware and firewall protection are only for the enterprise edition which starts at over $3000. if you can enforce a small group of users to keep their machines updated and secured, you can minimize risk and run the community edition daily. the community edition allows for banning specific files (name + extension), but denying all files of a certain type is reserved for the enterprise edition which starts at over $3000. with as large of a user base as owncloud has using the community edition, and that what gets uploaded affects all connected machines, this base functionality of banning specific file types, regardless of name - should be considered a security responsibility of the development team for the community edition. the community edition makes it easy to try before you buy. and the community edition may serve your needs if you are not a large business, referring to points i made elsewhere in my review. You'll wish that all support communities were as quick to respond as the group behind owncloud. have been able to make the process of getting all team members working on the same content much easier. were able to get past the limitations of other canned solutions, and control what options we wanted present in daily use. we have seen better stability with owncloud's desktop client than with other solutions. we have been pleased to find that owncloud works on shared and vps hosting packages equally well. being that many folks already use dropbox, and merging dropbox accounts can pose challenges, owncloud allows us to not interfere with existing dropbox use. "Your private cloud, all the control of your data for free"
Give a simple and efficient storage for your organization. When you share data with another user of ownCloud, these are not subtracted from storage, as in Dropbox. You can connect an existing LDAP and avoid having to manually create hundreds of users. An update without planning could cause damage or service drops. The mobile client is not very pretty and lacks many features, speed and ease of use that its competitors have. It is necessary to maintain the infrastructure. Manage the storage of a research department. The easy set up a configuration for users and file sharing in general. I also found really easy to synch and process all kinds of file regardless of the extension or size. It was a boom just after we got it in the office and giving each of us access to a private folder, something like an in-house cloud storage kind of thing, really special for us. The complicated way to integrate other technologies like FTP. The documentation for the implementation of other methods like FTP is rather complicated in comparisson with other tutorials. Be careful in having enough space available for storage as one of our first implementations got an error on full storage and we had to make some work to add extra memory so it could handle all of our files, honestly we have not expected to use it like we did, no surprise on how the simplified design and configuration of a cloud storage server can impact on how changed our persepctivo on how far could we go using it for our internal needs as a startup seeking for new creative, innovative and private solutions to help us getting igher in our day to day work. Having a local, private sharing storage service. Is a lot easier to get our work in a shared zone, with an easy configuration on who can see it, who can edit it and invite other collaborators. "ownCloud works well for me." ownCloud is great as it gives me access to all the files on my server from anywhere. I have sensitive files that I don't want to put in the cloud on Google Drive or One Drive. Too easy to hack those sites but where no one knows my URL it makes it much more secure. I still use other services to store non-sensitive data as sometimes it is easier to share a document with Google Drive. The only downside I have found is that it can be a nightmare to set up and configure. It is also very easy to "Break" if you play with the config files. Even if you are looking at a sample file with what they claim are correct configurations. I spent a few days getting it all configured. There are a lot of settings available in the config file and the documentation isn't the greatest when it comes to setting things up correctly. I would recommend owncloud to anyone that is looking for a solution for accessing their files from outside their network. Being able to access all my files from anywhere is great. I have several terabytes of files on my server, more than I could ever store with any of the cloud providers out there, at least not at a reasonable price. Once it is set up and configured it is pretty solid and does the job I need it to do. "Simplifies specific tasks of the company and streamlines work." It has a quick installation and configuration; does not require special permits. It allows extending its functionality with a multitude of applications. It is a Software that has improved a lot with the passage of time. In addition, the synchronization is as simple and direct as in Dropbox and the number of applications it has incorporated for its use is enormous. You can add all the users you want in minutes; It can be installed locally as well as on the server. 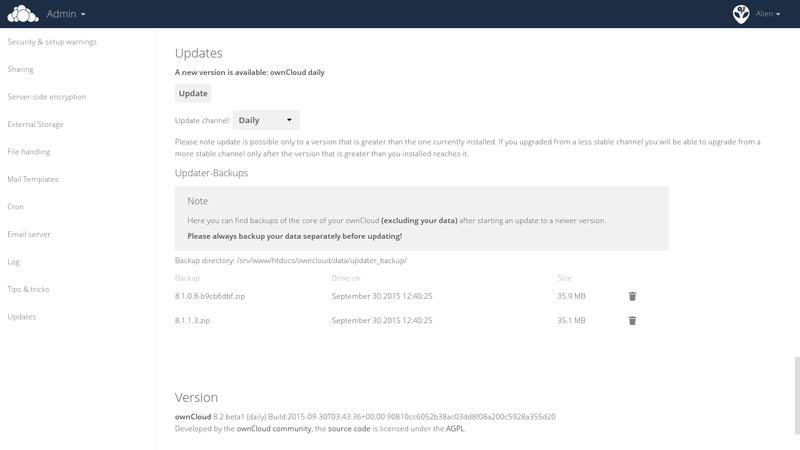 OwnCloud for Microsoft Azure is also available, with a template provided by the company Bitnami. Users can create groups to facilitate the sharing of files to a specific group of users, but also can limit access to shared content selectively (remove, modify, create, share). Finally we have the free option which allows you to test this Software and analyze if it is appropriate to the needs of the company. An aspect that generates difficulty to implement this Software may be that enjoying OwnCloud on its own server with all the guarantees is not within the reach of many. But it is a platform that is constantly updated and incorporates more and more aspects that are identified with the needs of users. It is a quite safe and reliable platform. Despite this, due to the constant demand for improvement is certain elements of the Software, the developers of the initial project launched NextCloud which is considered as a much more stable option. The recommendation that would make anyone interested in using OwnCloud without the necessary knowledge to install it himself would be to try it first through one of the existing providers and thus assess whether it meets perfectly with your needs, or that it does not arrive to cover them. I, for one, use it every day and, however, I do not dare to do without my usual tools. With OwnCloud I have had a good working relationship because it allows us universal access to our files. This platform allows us to easily visualize and personalize our contacts, calendars and bookmarks on our devices. For our company it is particularly important to have a link with our information that is simple and secure; that it simplifies concrete tasks of our work and that it reduces the time and cost of its execution. OwnCloud has allowed me to organize and control data and resources that I use daily to develop my work, as in many other departments of the company. "software installed on the server of my work environment, and serves as a central file "
The most pleasant thing about Owncloud is that we can download any document that is stored there when we want it on any PC or smart phone, we can load many files in different formats creating folders in our user, I use it daily as it serves as a central file for store digital documents, its interface is very friendly, it is an excellent program. The least favorable thing about this software is that, since it is linked to a server, if problems occur in it or it is damaged, there is a great danger that all the information will be deleted; on the other hand, it usually takes a long time the first time it is synchronized with a computer. I would recommend the use of Owncloud since it is a totally free cloud storage software, its use is very simple and its space for saving files will depend on what is assigned by the administrator. In my office, I stopped storing physical documents to save paper and opted to digitize everything, since then owncloud was used to fulfill the role of central file, and it worked wonders. "Decent solution for small business file hosting"
I like the ability to share links/files/resources with clients using software and a server that control. It sends a message of greater respect for their privacy. In the past, I have had some breakage during software upgrades. That has not been the case for the last year or so of point releases. My past use of file syncing software faced bugs and minor data confusion, haven'y used it since. I certainly recommend considering nextCloud as an alternative to ownCloud as I know many past developers from ownCloud left the project to start nextCloud (not unlike LibreOffice vs. OpenOffice). If you are looking to use file syncing, make sure you have automatic backups scheduled and snapshotting set up first! I have shared and distributed files to clients / prospective clients with ownCloud, fully integrated with my domain. "Easy to use, simple and evolutive"
The UI is very well designed ans esay to use. You do not need to read a manual to understand how it works. You can store your documents for you but also share them with another user or with a public link. Also, you can set a password. Another interestinf feature is that you can add comments to your files. They are pretty usefull if you want to add revision"s notes. The printing function from the PDF viewer does not work well. Once you start to use OwnCloud, it ecomes essential. Now I use it both for profesionnal and private. I always have access to my document and I can easily share them. I am all about decentralization and security. I think ownCloud is a fantastic platform for providing your users a secure place to host your own intranet files or some sort of collaboration service. I really liked the ability to collaborate with other ownCloud installs and send links that had downloadable content. It appears that a vast community of ownCloud developers went and started their own cloud software that seems to be more progressive in its technology. ownCloud seems to have had its time, but not sure it will be the platform of the future. We were trying to create communities that can share things privately. This required a space that fit security requirements and could be hosted onsite. The platform is a great step in that direction, but there are other better options IMO. "Never pay dropbox again !" Sometimes the latest updates for the desktop client can cause some sync or password issues. I have found that providing a new password can fix that issue. All of the regular functions that you can achieve on dropbox are available on OWNCLOUD without the huge expense. We are using Owncloud to share production audio files to all contributors. It is fast, easy and simple. If you love Dropbox, you'll love this, minus the pricetag. "A great private cloud service for your business." I first ran across ownCloud when I was looking for a customizable "Google Drive™" style service. It works much like the other cloud services but you host it on your own server. It has a very polished interface and many of the same feature-set people have come to expect from cloud-based storage services. While we haven't fully utilized the full potential of ownCloud, we foresee it allowing us to present a tighter and more professional workflow to our clients, while increasing our productivity. While it works very well and has the features of the paid cloud drives on the market; it does take some knowhow to get operational. While I believe most people will be able to get it installed on their server without much of a learning curve. It's still not a completely automated setup. There are also some server requirements that need to be met. I would like to see the ability to install this on a shared hosting situation (if there is I didn't find it). I would also like to see a more customizable interface to give us a closer match to our corporate branding and identity. If you have the need for a private cloud file system with a long list of features and you have the necessary server requirements, I would recommend ownCloud. We have our own private cloud system to house client files and give access to vendors. "ownCloud - Great for Remote Working"
Platform is easy to use (both shared folder and archiving options) and navigate, and is a great for remote working. Some team members did have issues with the shared folder automatically syncing and it would get out of sync (wouldn't update) without them knowing causing issues with adding double files or deleting unintentionally. Sometimes the system update would cause sync issues as well. I worked on a Mac and never seemed to have issues with syncing, but one team member who was on a Windows computer, constantly had issues. Some team members also had issues accessing the online archive folder as well. Great option for smaller companies that have a lot of remote workers who need access to files that doesn't require emailing or sending them, and updates in live time. We use ownCloud as a file management system, as well as a way to share files since all team members work remotely. Open source and free to use. I installed it on my private server and still use it to this day. It has some added functionality such as a calendar, password manager, office and also the ability to add more apps. This last one, I am yet to explore. Sometimes it is buggy. At times, it will sync the folders that I explicily removed from my sync preferences. I don't know if this also happens with the enterprise edition which I have not tested. For me, the web version works much better than the desktop (app) version. Sharing files between coworkers. Sharing password with associates. "Have your own cloud in minutes!" I like how you can have you own dropbox in your server, so you are not worried that someone else can access your private files, you can add any disk space to your server and increase your account's storage size, there's a possibility to encrypt all your data, you can install extra programs to mange contacts, calendars, and more. Also, it includes a mobile application that let me access and sync my mobile files automatically. You have to manually update the software and there's no too much integration from 3rd party services (Because it is not popular yet). Also, if you have encrypted files, software updates takes time because you keys have to regenerated or something like that. Having your own cloud without any size restricitions, also it reduces prices since it's cheaper to have a big servers than paying for a plan. Also, since it runs on my own server, I know that files are secure and even encrypted so no one else can access them. "Great free alternative to DropBox. Reliable and easy to use." It needs very little maintenance to run, and runs seamlessly. Its a great free alternative to dropbox, if you have the local storage to spare. While owncloud is great and does file versioning, make sure you set it up the way you want in the beginning because changing the configuration later is not that easy once you have people using it. Test first, and keep good backups! Providing DropBox capability for staff without having to pay large amounts for dropbox storage. Also internal file sharing and document sharing; synchronization between desktops and laptops. "Too fussy and difficult to use"
The files that I initiated are always available on my local drive. It's handy not to have to sign into the network to get a file quickly. The security set up, allowing cross-functional teams to see files is good. It is not intuitive enough for users to manage access to files, we hand that off to our IT support people. It has solved the problem of file storage on local drives. Own cloud does not tell you when you open a file that someone else has it open. You complete your work, and save, and THEN you find out someone else is working in the file. Conflict files all the time. A real time waster. Syncing is not immediate either. Sometimes it takes so long that we e-mail the file, defeating the purpose of shared folders. Consider how often more than one person could have the same file open. It's backwards that the software does not tell you that the file is already open. We need to have accounting files in shared folders for easy access. We no longer store word, excel or pdf files on local drives. This is a change I made when I took the position. Before that, files were stored only on local drives. In an accounting dept that relies heavily on Excel, this was time consuming. The other problem was being sure that the most up-to-date file was being used. As soon as it is set up it just works and does it's job without us touching it. Needs a bit of set-up before it is ready, so it a person with a fairly high lever of it-knowledge have to get it of the ground. it works and if it is what you are after, then go for it. the pricing if competitive and as far as i know support system is excellent. As all cloudbased storage and file management oen does have to firt analyse what ones need is and see if it fits what one is after. "Very good alternative to Dropbox "
There are two main differences between Owncloud and the rest of cloud storage applications, owncloud it's free and the data is saved in your own server. The sharing options are limited and aren't obvious to use. Even more, in the last version of owncloud, 2.30 if I remember correctly, it's really difficult to find the option to share, it's totally hide and quite difficult to use it. Very nice cloud, fast, secure, safe, efficiency, easy to use and log in, stable, confident. Excellent tool. I don't have any dislike of this tool right now, very useful cloud. I have all my file of my work safe and secure. Also I can access from anywhere, we have a integration in my workplace of this tool. "ownCloud is a suite of client–server software for creating file hosting services and using them. " The performance improvements, fixes and improvements for Mail Template Editor is very helpful. Content can be shared by defining granular read/write permissions between users and/or groups. Also, the ownCloud users can create public URLs when sharing files. If one misses the update then its hard to install newer version and the speed slows the file sharing process. Another one is that the Arch package doesn't include the ownCloud signatures, so I can't pass the integrity check. Something interesting to note is that if I try to reinstall ownCloud using pacman, it won't let me because I altered the permission or created an error by overriding it. Use it and see the difference. I use it as a weblink then attaching files, and also All cloud storage services reviewed in this topic have desktop folders for Mac’s and PC’s. This allows users to drag and drop files between the cloud storage and their local storage. The benefits are less storage is used and more data can be saved and compressed. "Self-hosted alternative to Google Drive, Microsoft OneDrive, Dropbox etc." - Free and open-source. Very actively developed and new updates are coming out very often. - Easy to install. Just grab a spare (networked) server, VPS or even just a shared hosting account, install Apache/NGINX, PHP and MySQL, unzip and off you go. - Privacy. Using this means that you have full control over your data rather than trusting a third-party like Google or Microsoft. OwnCloud even supports encryption of files. Enables businesses to more-easily comply with data protection laws while having the cloud convenience. - Extendable. Lots of plugins available to integrate with OwnCloud and the ability to make your own as well of course. - Strong user management/group functionality to share your cloud with multiple users. Ability to integrate with Active Directory and other similar products. - Desktop sync client and mobile applications really make this feel like a complete product. - Enterprise support available if needed. - Performance can be pretty poor at times, especially when dealing with large amounts of files. - Some features are still rather buggy/unfinished. It's constantly in development though so this is to be expected. If you're looking to host your own alternative to Google Drive, Microsoft OneDrive etc. 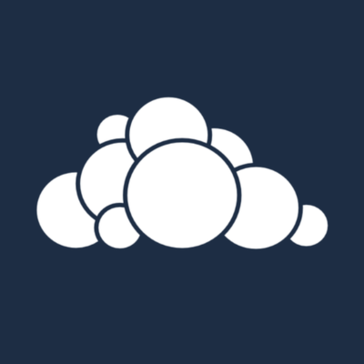 you can't go too far wrong with OwnCloud. This is the most complete alternative in a box that I've found so far. Ability to set-up my 'own cloud' (pardon the pun) and have full privacy and control over it. "Powerful open-source document server / sharing platform that gets better with each release"
It's open source, you can install the community version on your own server or VPS without any payment and manage it by yourself, or pay the commercial version with professional support. The main feature is saving files, sharing with others in the ownCloud and outside, similar to Dropbox or GoogleDrive. The sync client got massive improvements recently so now on Windows sharing via ownCloud can be performed from Windows Explorer easily, multiple accounts can be synced simultaneously, and selective sync can be enabled. Files are easily accessible also through a mobile apps on Android or iOS. The additional features of photo gallery, CalDAV calendars and CardDAV contacts are nice and can be synced with Mozilla Thunderbird/Lightning, iPhone etc. In the past the server and client had several bugs some of them critical (data corruption / loss). The user does not care that some of these critical bugs were due to upstream libraries such as Qt, when data corruption/loss occurs it's a reason to migrate to a completely different solution that is more reliable. The reliability seem to improve much recently but still I feel as the admin that there are rough edges and each update of client and server could trigger a new bug or regression that was not discovered before release. Consider other commercial options, don't go to ownCloud blindly. ownCloud is not "free", you have to spend some hours setting it up and educatiing users how to use it, and do troubleshooting when something does not work as expected. Configure the server you run ownCloud on proplerly beforehand, check errors in logs, warnings in owncloud administration, install proper caching packages, etc. Install only plugins you really need and that are stable enough. Consider how to deploy clients on client computers. If using other systems consider using ownCloud linked to LDAP / AD / other single-sign on. Be very careful before upgrading ownCloud server to a new major version, if using VPS consider creating a clone of the VPS and test whole upgrade process beforehand on a testing environment forked from your real installation. If using community edition subscribe to mailing lists of ownCloud and watch issues (bugs) on GitHub for new major versions before considering the upgrade. Our whole company migrated to ownCloud file saving, sharing across devices and users from no system before (just plain email attachments). Implementing ownCloud and sharing folders such as graphics files, documents etc was therefore a huge improvement. THe collaboration by having up-to-date files improved a lot. The ability to add dozens of users such as external and part-time workers without the need to pay for each user some license gradually compensates for the high initial installation and implementation costs, as well as debugging and communication with the developers when the critical bugs were triggered and had had to be resolved quickly. The setup is easy and the interface rather intuitif. "Owncloud is highly reliable and is the best cloud solution." With owncloud, we can use the application with any cloud server, in my case i use owncloud with the company server. I did not face any issue in syncing the data or accessing the data any single time. the ability to share the files and documents with others is an added advantage, we can email the link and share with people outside the company, share directly to another person's account within the company.In owncloud, creating folders of documents and sharing them is easy. Morover, there is owncloud app on android and ios as well, we can access the data on the go. It would be great if document viewing and editing is included in owncloud web and any option to preview files . Multiple access to files on the web through a common link and more collaboration features would be useful. there should be option of not syncing the files when on metered connection, this saves data and large files can be synced while on wifi. its definitely recommended to use owncloud for cloud storage and sharing . Its highly reliable and improves your efficiency. we used owncloud for sharing of documents internally and externally and cloud storage for our organisation . "Easy to use cloud service"
OwnCloud is easily accessible and easy to use to manage files throughout the company. Whether working from home or away on a business trip I am always able to get the files I need. The rights management works well and the interface is easy to use, looking rather similar to Google Drive. We had a few issues with syncing, especially syncing too slowly which can sometimes be rather frustrating. We needed a safe solution that can be accessed from anywhere and this is exactly what we got. We only use it internally which could be something to improve on. Own cloud is a personal solution to DropBox. You can download and add it to your own server, making it look professional when sharing files with clients. Realistically OwnCloud works out cheaper than any of it's rivals if you already have a web server, as you can control how much storage you have. The user interface is a little similar to its rivals where I feel it should have gone its own way, but this is a personal opinion, some people may like it. Using own cloud allows the easy sharing of files with my customers, such as design proofs, using my own domain name making it look much more professional. 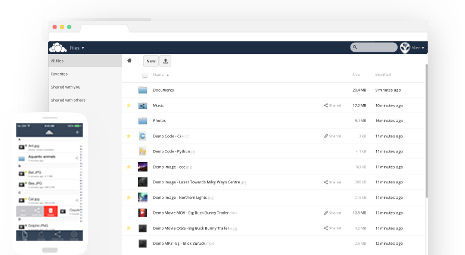 "Owncloud best open source file sharing ! " Works very good, as an open source gives the opportunity to play around with some tools. Easy to implement. Secure, stable. you can sync with android or apple app. So far everything has worked excellently as expected. Yes I highly recommend using an owncloud server, really do de job. The file share in a secure environment with the right software is a really hard decision to make. but owncloud have the necessary tools to make it real and simple. "Excellent solution to storage and share files and build your private environment"
The interface has an excelent usability. The software is very easy to install and to update. You can really deploy in a few minutes. Is also possible to use several storage strategies, such as FTP, local storage, NFS, etc. The documentation is very helpful and detailed, since installing till managing. There is also an owncloud community to help, solve doubts and to contribute to open source projects. Sometimes there are some problems with file uploads, mainly if is a big file. If you have slow connection, you can also have some problems when listing files. When installing, you need to do a lot of tests to make sure that file uploads are working correctly using the web interface or client apps. File storage for final users and content sharing among internal and external users. "Fast tool for data sharing, storage and synchronization"
The unlimited space and therefore that you pay for the number of users and not for the dataspace. Sometimes the down- and upload is too slow for my opinion but overall I like the tool. I can recommend the tool if you need a reliable and fast way to store your data. All our employees store their data and files with owncloud. "Solid cloud storage solution for self-hosting"
I love that it's self-hosted, and the clients for Android, Linux, Mac, and Windows are awesome. Frequent updates that break plugins are annoying, but otherwise nothing major. ownCloud is great, though you should also look at nextCloud (a fork of ownCloud). I use ownCloud for cloud storage of my backup files, it's been a great alternative to Dropbox or MEGA. "Excellent solution for cloud collaboration"
Easy to setup and used, this open source solution is one of the best alternatives for file sharing and collaboration on the market, while being a cost effective solution since it runs on linux. The search inside the documents is still flaky (sometimes works, sometimes it won't work). On site document editing is limited to TXT files only. "Best free software for collaborative working "
The ability to share and collaborate as well as version history of documents. The ability for remote employees to work together on multiple projects. We are able to review document history to manage changes. "Macht genau was es soll"
Es macht genau das was es soll und nichts anderes. Assets could be easily overwritten by mistake. We ran into issues with access disappearing or not being viable which was extremely challenging. Making sure that when assets are placed they are not able to be removed easily. We were trying to use ownCloud as a way to provide access to our partners that could be easily utilized via email or other mediums. "Easy installation, easy administration, secure, free"
its free, and easy of use for administrators and for users. You can sync your desktop files and you will have backed up it.